The signs of aging happen to all of us, but savvy men and women know there's no reason to just sigh and accept the changes. Injectable fillers like Restylane® can restore youthful volume, eliminate wrinkles, and take years off the appearance of your face – all with a treatment that is non-surgical and requires no down time. Anti aging treatments with Restylane® are available from our St. Louis-area practice for those who want exceptional results without undergoing surgery. Restylane® is the only injectable treatment approved by the FDA for use in the lips. Additionally, Restylane® can be used to treat smoker’s lines and to reduce the appearance of bags under the eyes in a non-surgical lower blepharoplasty. Find out more about what this versatile dermal filler can do for you. Contact The Lifestyle Center and schedule an appointment today. Restylane® is a clear gel made of hyaluronic acid, a substance that is naturally present in the body and contributes to volume and firmness in the skin. It contains no animal proteins, and therefore does not cause allergic reactions. Biodegradable and biocompatible, Restylane® has been safely used in the United States since 1996, and for a longer period of time in Europe. Hyaluronic acid molecules hold 1000 times their weight in water. They work to attract and bind moisture, effectively plumping skin tissues with this increased hydration. Restylane® fills the space between elastin fibers and collagen that naturally deplete with age. This creates a more full, youthful appearance in the face. Lip Augmentation: Injections to define the lip line and plump the lips can provide subtle or dramatic results, depending upon your preference. Lips naturally lose volume and definition with age, and this enhancement can help melt away the years. Pucker Lines: The tiny vertical lines that appear just above the upper lip can be caused by smoking, but also result from genetics and facial anatomy. Restylane® injections can soften these lines, resulting in a smoother upper lip and less lipstick feathering. Smile Lines: The lines that extend from the sides of your nose to the corners of your mouth are very treatable with Restylane®. The injections plump and smooth this area, increasing volume and fullness. Marionette Lines: Extending from the sides of the mouth and down the chin, these creases have a marked aging effect. Restylane® fills in and virtually erases these lines, for a pleasing, youthful result. Chin Augmentation: The chin often develops a horizontal crease or hollow pockets over time, which can be treated with Restylane® by smoothing the line and filling in the sunken areas. 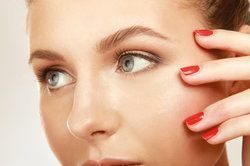 Under-eye Hollows: The hollows beneath the eyes accentuate the appearance of under-eye bags. Restylane® injections in these hollows and in the tear troughs are effective treatment for this problem. In fact, Restylane® is sometimes referred to as a non-surgical eyelift! Crows Feet and Frown Lines: The lines that radiate from the outer eye can be softened and smoothed by Restylane®. It can also treat creases that occur in the area just above the nose. Restylane® injections can be performed on your lunch hour. The areas of treatment are lightly numbed with a topical gel prior to injections, which most patients describe as only minimally uncomfortable. You may experience some minor swelling and bruising, which usually resolves in a few days. Restylane® treatment typically lasts for about six to twelve months in the areas around the mouth, and sometimes even longer around the eyes. Discover what Restylane® and other injectable skin treatments can do for you. Contact The Lifestyle Center and book your appointment for a free consultation today at our convenient Ladue location, just west of downtown St Louis.